I am creating this thread to document an experiment that will test the efficacy of "general purpose items" as opposed to motorcycle specific items (aeresols). For the experiment I will be lubing the chain every 500 miles (or sooner if I get caught in the rain, ride thru mud etc). 2) Spray Kersosine K-1 ($8 per gallon at Walmart) from a spray bottle and coat the chain and sprockets GENEROUSLY. 4) Use a knockoff of the "Grunge Brush" a 3 sided nylon brush ($5 on Amazon) to scrub the chain and sprockets. 5) Rub a large piece of newspaper along the chain to remove as much build-up as I can. 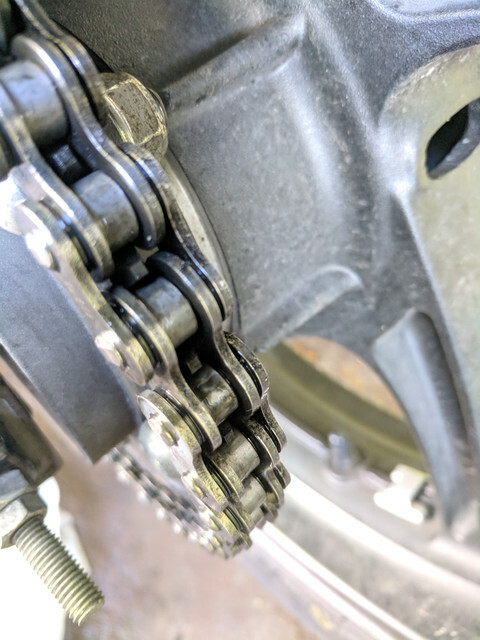 12) Use a paper towel to dry any excess lube from the chain. I posted these as a "baseline". So that you can see what I am starting with. 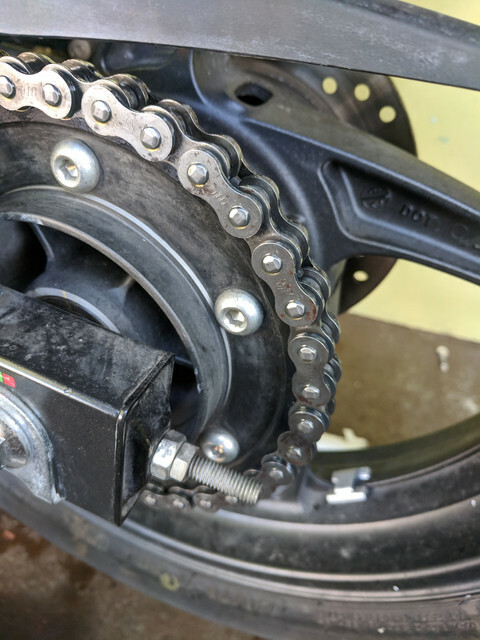 I will be updating this thread after each chain cleaning and/or lubing so that you can see how the chain wears and progresses. I hope this research will be helpful to forum members. I am putting many potential Myths to the test here. You will notice that in my steps I do not start with a "warmed up bike" or a "hot chain". This is one potential myth that I wish to put to the test. Whether it makes any difference if you "Go for a 15 minute ride first" before you begin. So we shall see. Entry 1: 1950 miles 10/10/2016 Here is how the chain looks after cleaning and lubrication + wiping off excess lube. Freezuch, Hi-Viz-Honda, qson and 1 others like this. I wish you luck and definitely appreciate the effort! X-ring and O-ring chains are made so the internals are sealed and you don't need to try to get lubricant inside. They only need lube on the outside which is why dry lubes are better. It doesn't fling off like oil and neither does it collect as much dirt. If you take the front sprocket off, lube the splines with a high moly grease when you re-install it. shisoshin and King CobRa like this. for ocd its in motorcycle maintenance..
King CobRa and airhead83 like this. I was caught in the rain on 2 days in a row (rain that came without warning) and the bike got soaked for 1 hour in the full blast rain. 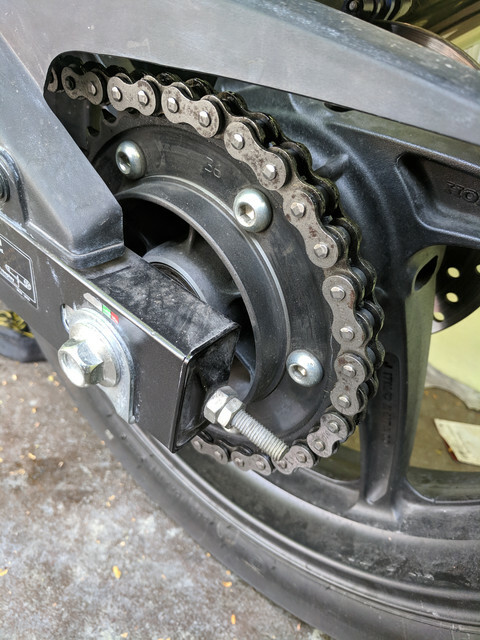 Today I used a newspaper to wipe the chain down (no chemicals or brush) and I then applied a coat of gearbox oil as per the procedure in the original post. There was surprisingly still some lubrication on the chain (a slight shining) but so far, so good. The gearbox oil is doing a great job as a chain lubricant and anti-rust preventative. Its a sad shame that I bought the bike with rust already on the chain and I did my best to scrub that off but you can still see imperfections and rust stains and there is really nothing that can be done about it. I hope you dont allow that to color your perception of the experiment. Here is a photo I took after applying a new coat of oil on the chain this morning. 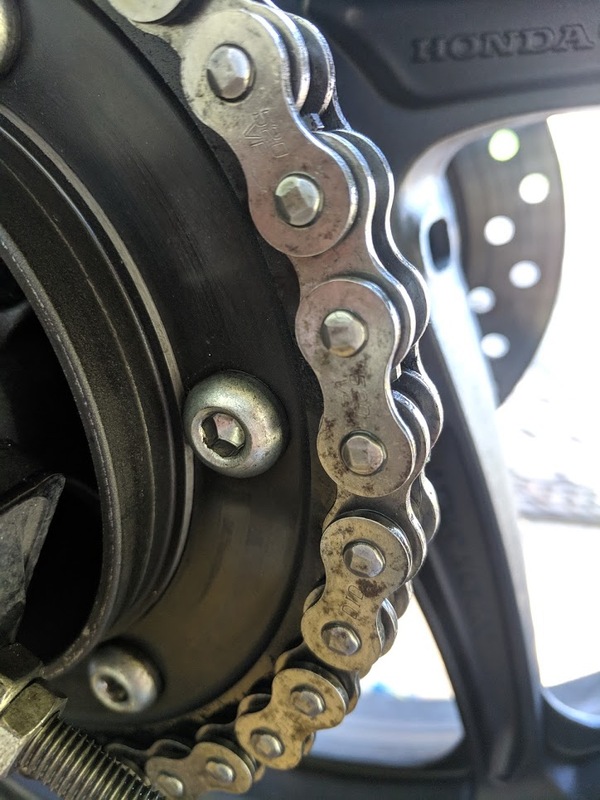 Basically the chain looks the same as when we began the experiment and I am happy to report that it is not picking up alot of dirt and grime so I am pleased so far and will continue to update this log but only at 500 mile intervals from now on. 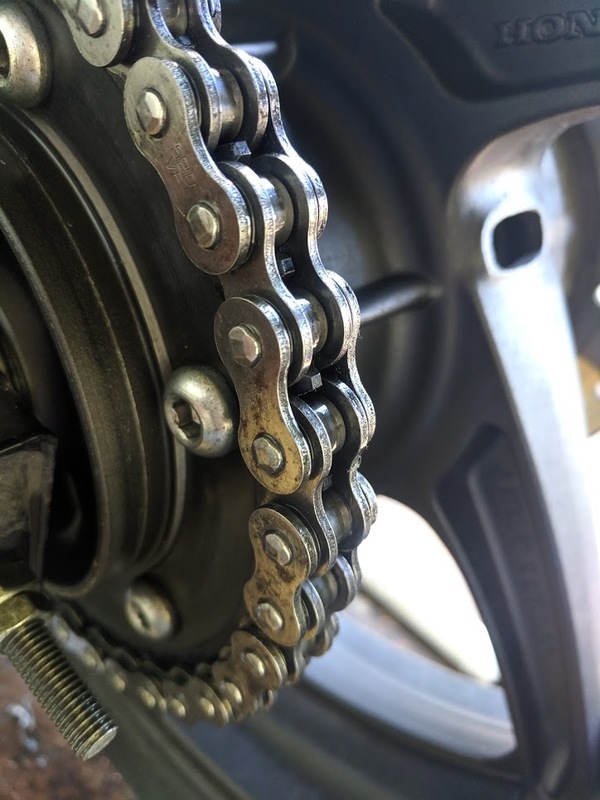 I will be cleaning the chain with Kerosine and the grunge brush at every 500 mile interval but in between I wont do anything other than re-lubricate the chain if I get caught in the rain or after giving a wash to the bike. EDIT: On the last photo you can still see some yellow dots of oil. That is how it looks if you wipe it down half-asse.d but after the photo I wiped it down one more time and that got rid of the excess oil. EDIT 2: The pictures really dont do it justice. The chain really does look alot better in real life then what the photos display. Maybe I will just stop with this thread because the chain looks worse (in the pictures) than it really is and basically I am not going to convince anybody that this is a good idea because the photos look so poor. I will only be posting updates on this thread at 5k mile intervals (from now on). I am hoping to get at least 15,000 miles out of this chain. I have cut out alot of extra steps from the original process. From now on I am only taking the front sprocket cover off every 2000 miles to clean the front sprocket so that means only on "even" numbered intervals such as 2000, 4000, 6000. Else I do a full cleaning every 1000 miles and I do a lubricvation every 500 miles UNLESS there is rain in which case I lube the chain once again after rain or after washing the bike. As you do your own chain you will become more and more efficient and will be able to cut out un-necessary steps. You can see my own evolution inside this same thread. As you can see the gearbox oil is doing a great job. Its really all you need, just buy the $15 gallon jug and have basically a lifetime supply of chain lubricant. No need to wash the brush after each cleaning, just put it away wet inside of a plastic glove like the ones they use at Subway when making your sandwich. They sell those gloves at Dollar Tree. They are same ones you get with a package of hair coloring dye. Yeah THOSE gloves. Hi-Viz-Honda and airhead83 like this. I have used the brush and 80/90 for a long time. Some people do the same thing with ATF. Gear box oil is designed to cling somewhat to gear wheels and be squeezed between them. 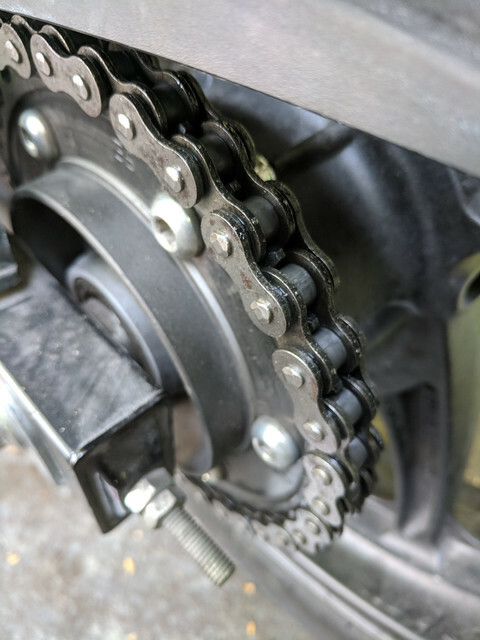 A chain and sprocket is a similar situation. It does fling a little on the first ride, but is very easy to wipe of with a rag that's had a squirt of WD40.